Check out these amazing copper facts, uses and properties. Copper has been used since ancient times and its alloys include brass and bronze. It is used to make coins and is found in many appliances we use everyday. Learn more about this well known metal and its unique properties with our interesting facts about copper. Copper is a chemical element with the symbol Cu and an atomic number of 29. The word copper and its symbol Cu come from the Latin word for Cyprus "Cuprum", where the Ancient Romans mined much of their copper. Pure copper is red-orange in color. When it is exposed to air it darkens to a brown color and if exposed to air and water, it becomes a blue-green color called verdigris. The only two metals used by humans before copper were gold and meteoric iron. Copper is believed to have been in use since ancient times over 10,000 years ago. Small amounts of copper can be found in a natural state while the metal is also found in minerals such as cuprite, malachite, azurite, chalcopyrite and bornite. Copper is an essential nutrient to all living organisms. Copper deficiency in the human body is as big an health issue as iron deficiency. Foods rich in copper include oysters, beef, nuts, cocoa, black pepper, lobster, sunflower seeds, green olives, avocados, and wheat. 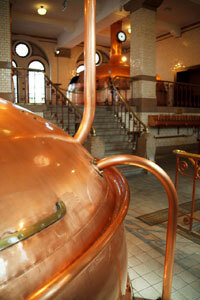 Due to its versatility and durability, copper is referred to as "man's eternal metal". Copper has a melting point of 1,984.28 °F (1,084.6 °C) and a boiling point of 4,643.6 °F (2,562 °C). Numerous important copper alloys have been produced over human history. Brass is a mixture of copper and zinc, bronze is an alloy of copper and tin. While cupronickel is a combination of copper and nickel. 60% of copper is used in electrical wiring, 20% is used in roofing and household plumbing, while 15% is used in the making of industrial machinery. Copper is used in the making of coins for a number of countries. Coins in the U.S contain a solid copper core and layer of copper-nickel alloy. Copper is also found in TVs, radios, washers, dryers and some cookware. Over 81,000 kgs (179,000 lbs) of copper was used to build The Statue of Liberty. Copper is a natural antibacterial. To prevent the spread of bacteria, brass doorknobs and handrails are often used in public buildings. Because bacteria will not grow on it, copper has been used for centuries to line parts of ships so that barnacles and mussels do not stick to the boats. Nearly 80% of all the copper we have ever produced is still in use today due to the fact that copper is 100% recyclable and retains 95% of its original value. Copper is a plentiful natural resource on Earth. At the current rate of extraction there is enough copper in the top kilometer of the Earths crust to meet demand for 5 million years. A mine in Sweden called "The Great Copper Mountain" operated from the 10th century to 1992. It produced two thirds of Europe's copper requirements in the 17th century.